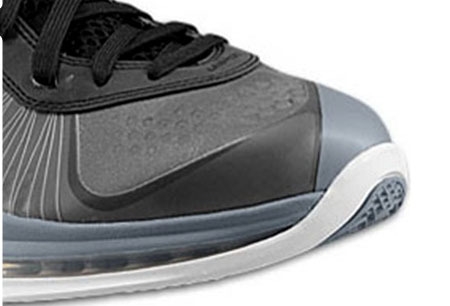 First look at the Nike Air Max LeBron 8 V2 in this all new black and grey colorway. Earlier this week, we gave you a look at what we can expect to see on the feet of LeBron James once Christmas rolls around. We can also expect Christmas day to be the debut of the Air Max LeBron 8 V2. Aside from the Christmas colorway, this black and grey colorway of the V2 will also be seen on the court sometime during LeBron's first season with the Miami Heat. The LeBron 8 V2 immediately appears to be much lighter, working with a mesh like construction, that appears to incorporate Nike's Pro Combat tech on the toe, side panels and ankle area. 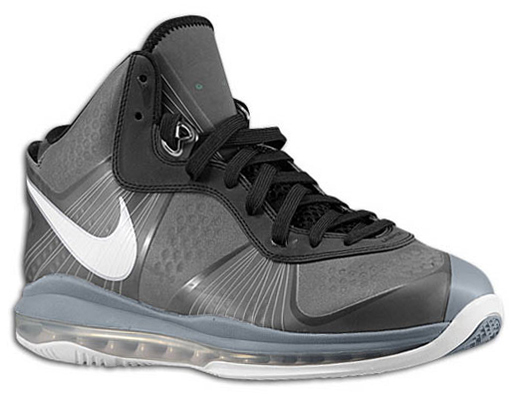 Flywire is also seen, providing a maximum lockdown fit on this second version of the Nike Air Max Lebron 8. Seen here is the V2 in a simple black, grey and white colorway, which is expected to release sometime in the future, most likely after the release of the Christmas edition. As you'd expect, nothing is confirmed as of yet. Keep it locked to Sole Collector for the latest on an official release and a closer look at what the future holds for the LeBron James Signature series.